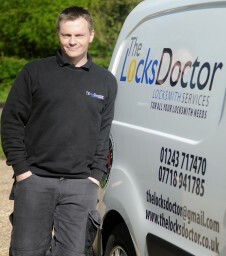 Local Independent family run locksmith company Welcome to the Locks Doctor Locksmith Services. Friendly family run independent locksmith company We are a local and fully independent family run emergency locksmith company based in Emsworth. We cover the whole area between Fareham, Gosport, Portsmouth, Havant and across to Chichester, Selsey, Arundel, Littlehampton and as far up as Petersfield, Midhurst, Liphook. We are both residential and commercial locksmiths who specialise in non destructive entry. We can replace and install all types of locks, and due to the large amount of stock carried we can more often than not complete jobs on the first visit. No job is too big or too small and you can be assured that all parts fitted are of the highest quality and where needed conform to BSI insurance approved standards. If you are locked out we offer a fast response service and will aim to be with you within 30 minutes, and for not so urgent jobs within the hour. We are also TRADING STANDARDS APPROVED MEMBERS for that added peace of mind. And remember NO FIX NO FEE this also applies to lockouts if we can't get you back in (which so far has never happened) there is no fee to pay.